I'm so glad that the weekend is almost here, because that means that it's officially vacation time for us! We are beach-bound and I'm only slightly nervous about spending more nights away from home with a newborn than we've done. Thank goodness for large cars! A quick update on our Five On Friday link-up -- we are officially going on summer break! Don't worry, it's temporary ... we love this link-up and love reading the blogs of all who participate. After this brief hiatus, we will resume the normal Friday shenanigans and we'll keep you posted when that is going to happen. 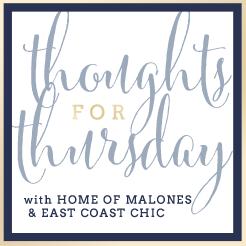 For now, I'm taking part in Thoughts For Thursday ... you can link up here! Yesterday, we were invited to our very first playgroup, and while Camille was definitely the youngest babe there, it was so awesome to be included in this fun mommy group! She was on her very best behavior, so I hope we will be asked back ;) Some of the Moms had awesome things to say about the Miracle Blanket, so I purchased one yesterday -- will give it a few nights and can't wait to report back with our experience. $32 at Target Last night, we enjoyed a visit with my Aunt and Uncle, and they just loved Camille! They brought over wine and the yummiest dip, which my sister has blogged about before. I'd totally recommend this dip, it is heavenly! Cheesy Hearts of Palm Dip photo via The Reedy Review Lastly, I adore me some MHM -- she sent me the sweetest surcee this week -- guess the name of this brow highlighter color? Camille! MHM, I just love you so. Her new blog The Chardonnay Kitchen is the jam. But you already know that. That's all I have for now ... see you all tomorrow for a different kind of Friday blogging, and remember, Five on Friday will resume after a brief summer break! I swear by the miracle blanket, the only thing that C couldn't get out of! It's def like a little straight jacket but once it's on she loved it. Hoping the boys feel the same! Camille is a beauty! Enjoy your vacation lady! I am following in your tracks next week and going off the grid - cannot wait! Yay for your first play group!! 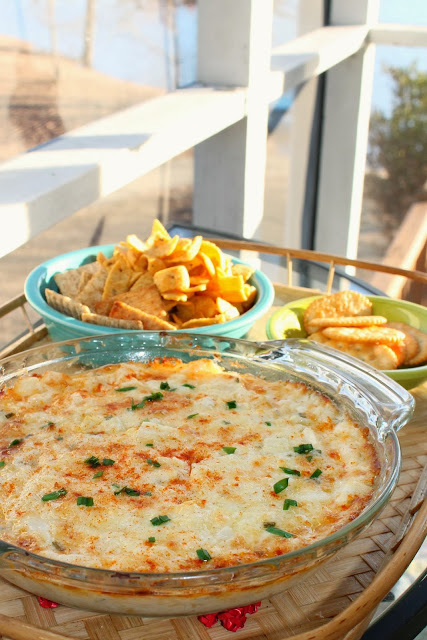 That dip looks amazing, I'm going to need to make that when we have people over! Aww, I'm sad we missed you girls at playgroup! We couldn't come bc our new air-conditioner was getting installed, yay. Hopefully we will be at the next one!! We used the miracle blanket the first week but then she got too frustrated when she couldn't move her arms so we switched to the Aden and anias ones we had (the same ones you blogged about before). Hope it works and have a great beach trip!!! I love all the new little swaddle blankets. Makes it so nice to tuck them tight. Isn't MHM the best?! That's so sweet of her! Have a blast at the beach! Thanks for sharing Natalie and I's link-up . That dip looks so delicious and I can't wait to try out the recipe! Have a wonderful time at the beach!!! Great seeing you yesterday and meeting Camille. She's just as sweet in person as she is in your photos! I went and bought the Miracle Blanket too but did not have good luck with it. Shelby would get twisted/tangled up in it trying to break out. I was paranoid about her suffocating if it got over her head. Much bigger fan of the sleep sacks instead. Hi there! Have you tried the Aiden swaddle bags that snap and wrap around them? My little girl is just a few days younger than yours, and those are our current favorite. I still feel like she's a bit too small for the miracle blanket. They've had the Aiden bags at Tjmaxx lately for a steal!